This week, Venezuelan President Nicolas Maduro sent an offer to swap far-right opposition leader Leopoldo Lopez in exchange for Puerto Rican political prisoner Oscar Lopez Rivera, who has been locked up in U.S. federal prisons for 33 years. Leopoldo Lopez was arrested in February after he helped lead a three-month campaign of violent opposition demonstrations attempting to incite a coup against Maduro. But as a true act of international solidarity, President Maduro is willing to release this dangerous criminal to secure Oscar Lopez’s freedom. “The only way I would use (presidential) powers would be to put (Leopoldo Lopez) on a plane, so he can go to the United States and stay there, and they would give me Oscar Lopez Rivera—man for man,” Maduro said during a televised broadcast on Jan. 3. Oscar was born in San Sebastian, Puerto Rico, but at a young age moved with his family to Chicago. Growing up in Chicago, he emerged as a community leader who organized around education, health care, unemployment, and campaigns to free political prisoners. He helped found the Rafael Cancel Miranda High School, now known as the Dr. Pedro Albizu Campos High School, a half-way house for convicted drug addicts and much more. As a member of the Puerto Rican Marxist-Leninist organization La Fuerza Armadas de La Liberacion Nacional – FALN (Armed Forces of National Liberation, FALN), Oscar Lopez became very active in the struggle for Puerto Rican Independence from within the belly of the beast. In 1975, the organization was forced underground, and after five years the FBI captured him and his comrades in 1981. Oscar was sentenced to 55 years for a number of charges including seditious conspiracy. This struggle against the existing U.S. colonial rule over Puerto Rico and the right of the Puerto Rican people for self-determination is something that we stand firmly behind. And President Maduro’s offer is a reflection of this same international solidarity for freedom fighters around the world. In 1999 then-President Bill Clinton actually gave an offer of clemency to Oscar Lopez, but he turned it down because he did not want freedom if all his comrades were not free with him—showing a continued commitment to his valves and the fight for liberation of his people. Obama on the other hand, has joined the call of those on the right for the freedom of Venezuelan opposition leader Leopoldo Lopez. Calling him a political prisoner who is unjustly imprisoned—what hypocrisy! When people fight for justice against U.S. imperialism and are placed in prison, they are convicted as terrorists. But when opposite leaders attempt to destabilize the governments of anti-imperialist nations like Venezuela, they are somehow political prisoners. U.S. State Department spokeswoman Jen Psaki responded to Maduro’s offer to swap prisoners this week by stating that the cases of Oscar Lopez and Leopoldo Lopez do not even compare. But in the wake of the prisoner swap this past December that led to the release of the last three remaining members of the Cuban Five, there has been a renewed effort to fight for Oscar Lopez’s release. The latest example was exemplified on January 6, Oscar’s 72nd birthday, when a social media campaign to raise awareness about his case was initiated by his supporters. The National Boricua Human Rights Network and La Respuesta Magazine initiated the call, which got tens of thousands of people from around the word tweeting and posting for the release of Oscar Lopez. 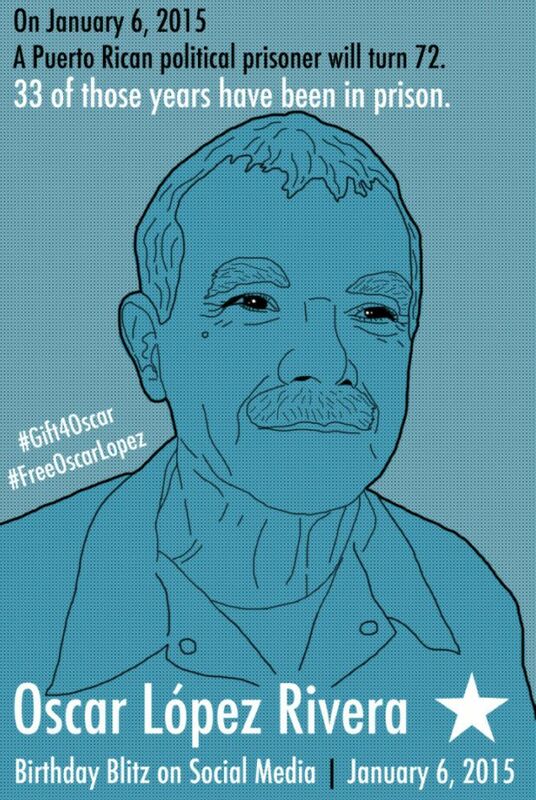 Using the hashtags #FreeOscarLopez and #Gift4Oscar, creative calls for Oscar’s freedom and an end to U.S. colonialism circulated all throughout Twitter and Facebook. The PSL has continued to be militant participants in the fight for Oscar Lopez’s freedom and the freedom of all political prisoners here in the United States, and we salute Venezuelan President Nicolas Maduro for his commitment to international solidarity for revolutionaries around the world. The fight for Oscar’s freedom continues to provide inspiration for new generations of Puerto Rican independence fighters in the struggle against U.S. colonialism. After 33 years of imprisonment in U.S. federal prisons, it is critical now more than ever we continue to place pressure on this administration to Free Oscar Lopez and work harder in the fight for a free Puerto Rico. Que Viva Puerto Rico Libre!